AC/DC are one of those instantly recognizable bands and much of that is down to their powerful but clear guitar sound. Simple and effective riffs combined with a no frills approach is the order of the day for the rockers from down under! There’s no denying that Angus Young and Malcolm Young will go down as having some of the best rock n roll tones in history but their setup and approach is surprisingly simple! If you’re aware of how they got their tones then trying to emulate them becomes much easier and we’ll talk you through what you might need in order to get their sounds. Angus Young has rarely been seen without his trusty Gibson SG and those mid-range heavy pickups are just what you need to get the biting, powerful tones that he gets. You could describe his lead lines as ‘stinging’ and this is largely down to the warm mahogany body of the guitar combined with potent pickups. The lighter body of an SG also means you can fly around the stage and wield your guitar like a weapon whilst doing the duckwalk across the stage! 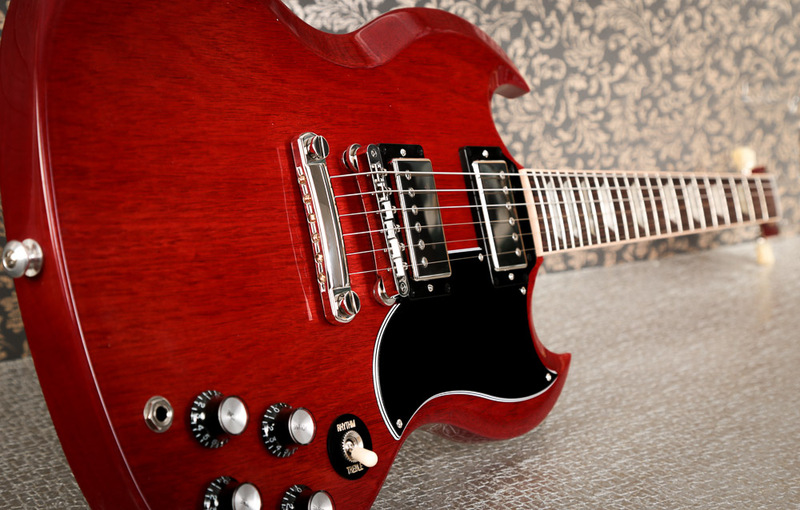 Gibson SG guitars have got a signature sound of their own and it’s probably epitomised by Angus Young. Want ACDC tones? 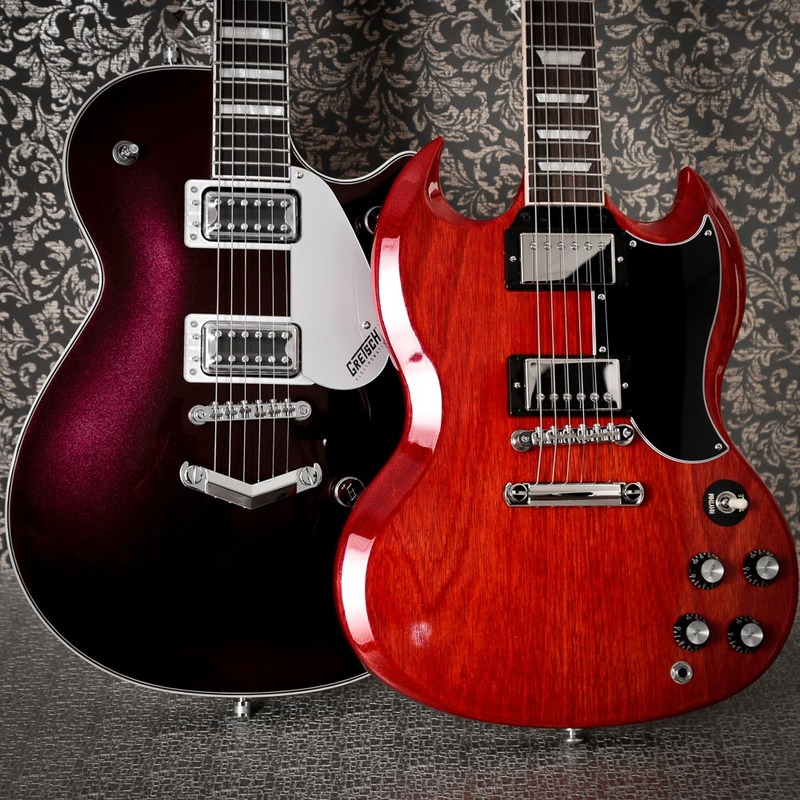 Get an SG. Malcolm used a Gretsch throughout his ACDC career and his metronomic, groovy rhythm playing was supporting by the crispy top-end of the Gretsch pickups. 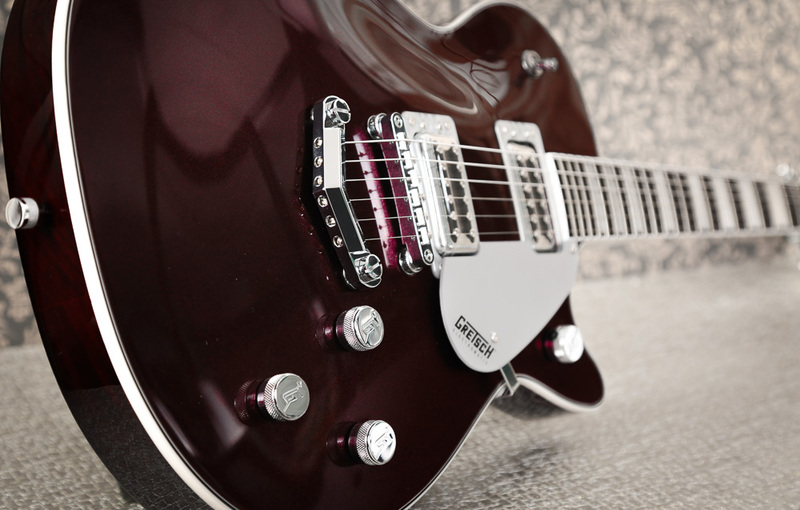 For similar results, a Gretsch with TV Jones style pickups would obviously do the trick! You’d want a solid body Gretsch to get a slightly fuller tone without the ‘air’ that you might get from a semi-hollow or hollow body. The guitar amp is a big part of where ACDC get their ‘sound’ from. Essentially, they just crank up Marshall Plexi amps which are surprisingly not high gain amps. But when turned up that loud, they’ll break up the speakers for that classic rock sound. So, get a good valve amp and crank it up and keep the gain down where possible. You don’t need as much gain as you think. One piece of advice I was given to get that Angus Young sound was to turn all of the EQ knobs on your amp up all the way. It really worked! The gain doesn’t need to be high but you can ‘open up the floodgates’ by doing this and really give your guitar a voice. It’s almost like you’re not restraining any frequencies from your guitar and when combined with a nice sounding valve amp, you’ll get a ton of rich overtones coming through. This is a really interesting one because you probably don’t need any pedals if you’ve got the right sound coming out of your amp. The ACDC sound is quite dry, so you won’t need modulation, delay or reverb pedals. The bass drives the low-end and the rhythm from the drums and rhythm guitars is what really makes the tracks. On top of that, you have Angus Youngs blues-inspired lead licks with the amp cranked up to ten. It’s a simple formula in theory but a little more tricky in practice. If you were to get any pedal, it would need to be a boost pedal to push your valve amp over the edge. Any boost pedal will do but if you really want to nail then tones then you might want to check out a company called Solodallas. They built the wireless system that Angus used and he favoured it for the way it flavoured his guitar tones more than their actual functionality. Fortunately, in the modern day, we can get these tones with the right pedals and Solodallas pedals will definitely get you into the ballpark. It goes without saying that the ACDC guitar sound is invariably large and iconic. It is also quite a simple setup but much more can be said for the style of playing than the actual gear played. Angus and Malcolm both attacked their guitar parts with vigour and that attitude in their guitar sound comes from the way that they both play. Keep the setup simple, use guitars with humbuckers into a Marshall-style amp. It’s a long way to the top if you wanna rock n roll but if you keep the gain down and the volume up, you’ll get there!